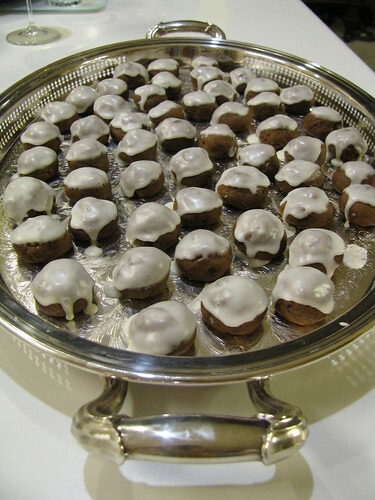 These cookies are rich chocolate raisin spice citrus balls of pure bliss. This is one of the most unusual and delicious cookies I've ever tasted and an all-time favorite recipe of mine. Even the ingredients look good, sitting there expectantly, waiting to be blended and baked into something yummy. Combine raisins and orange juice in a small bowl; let stand at least 10 minutes. Beat butter at medium speed until creamy; gradually add sugar, beating well. Add egg and next 3 ingredients, beating well. 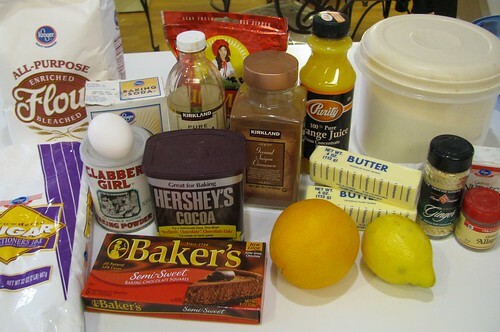 Combine flour and next 7 ingredients, stirring well. Shark Boy loves to cook. I hope that sticks. He'll make some girl a good husband someday. Isn't a man in an apron wonderful? Add half of flour mixture to butter mixture, beating well. 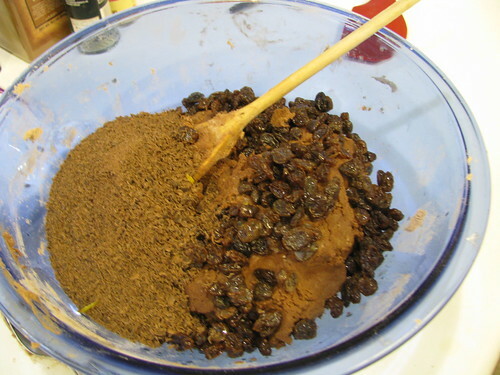 Add raisin mixture and grated chocolate, stirring until well blended. 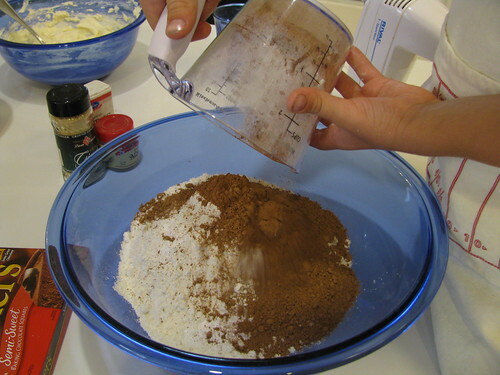 Stir in remaining flour mixture. 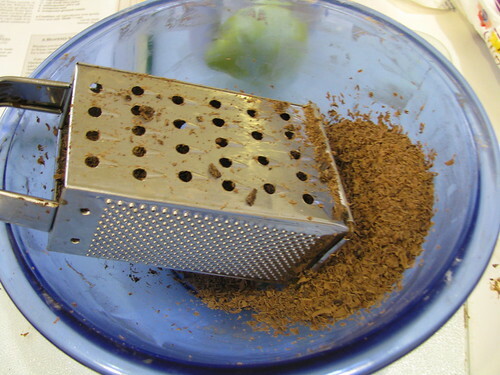 Our sophisticated chocolate grating method. I call it elbow grease. It's an excellent upper body workout. I mentioned these cookies were rich, right? 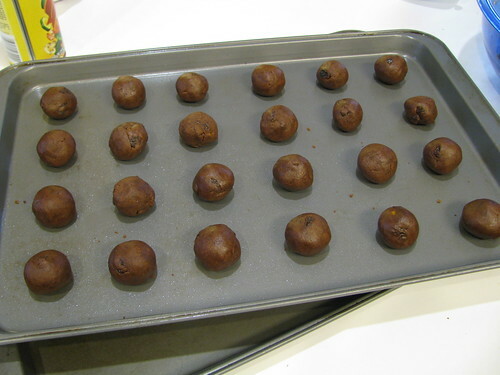 Shape dough into 1-inch balls, and place on lightly greased baking sheets. Bake cookies at 350 for 9 minutes or until almost firm. (Do not over bake.) Cool on baking sheets 3 minutes. Dip cookies in Lemon Glaze. 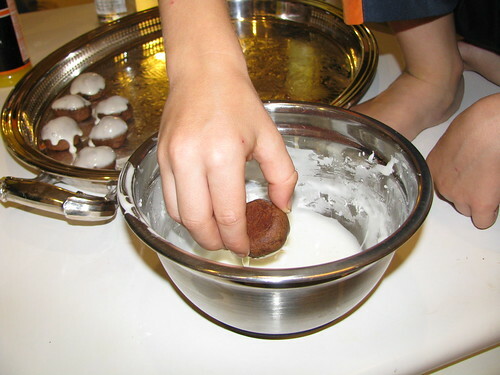 Store cookies in an airtight container up to 3 weeks, or freeze up to 8 months. More Mouthwatering Monday over at Rachel's place. Leisa - HA! Sure, if Alexandra allows smudges on the handles of her silver tray. That tray is actually special. It's an enormous silver piece my mother-in-law gave me. Yummy! Those look really good. I'm just making pain old chocolate chip for the monkeys. Actually, I quite like cooking, especially puddings and things that are bad for your teeth. Whoa! I'm making these at Christmas. Thank you! Wow, those look and sound amazing! I'll definitely have to try these soon, maybe even add them to my Christmas cookie list. Nah, I'll just save them all for myself!! They look yummy...I was just thinking about baking the Deceptively Delicious chocolate chip cookies (they have chickpeas in them). Sounds gross but they are soooooo good! 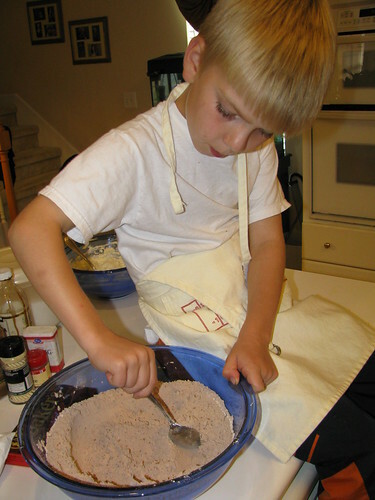 and the baker.. too precious for any words.